When a cancer patient receives a bone marrow transplant, time is of the essence. Healthy stem cells, which can restart the production of blood cells and immune system components after a patient's own are compromised, need to make their way from the circulatory system into the bones as quickly as possible. To do that, they must find the spots where blood vessels and bone are in close contact. 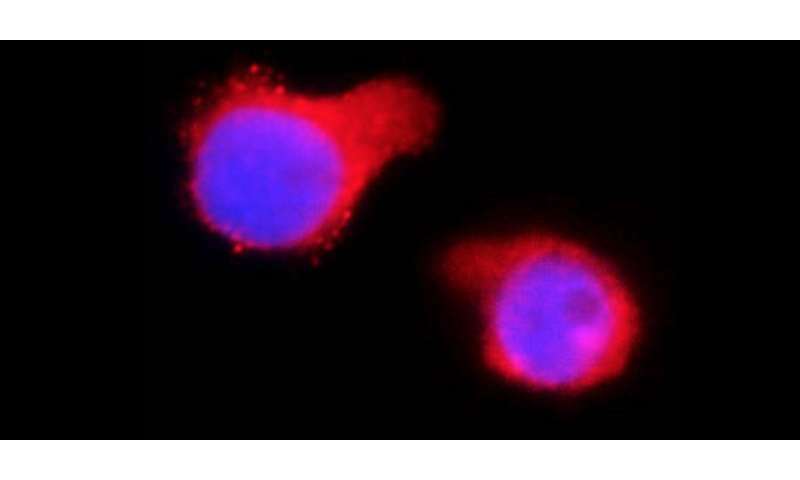 Researchers at the University of Pennsylvania's School of Engineering and Applied Science have found a property of these stem cells that may speed this restart. Like salmon returning to spawn, some stem cells fight the circulatory system's rushing flow of blood and travel upstream. Through in vitro experiments, the researchers have also begun to show which surface molecules are involved in these cells' ability to anchor themselves to blood vessel walls and move themselves against the direction of flow. Understanding this process could lead to new ways of preparing the stem cells in a bone marrow transplant, making them faster and more effective. The study was led by Alexander Buffone, a postdoctoral researcher in Chemical and Biomolecular Engineering, and Daniel Hammer, Alfred G. and Meta A. Ennis Professor in Bioengineering and in Chemical and Biomolecular Engineering. Graduate student and fellow Hammer lab member Nicholas Anderson also contributed to the study. It was published in the Journal of Cell Science. The cells at the focus of this study, hematopoietic stem and progenitor cells, or HSPCs, include true stem cells as well as cells that have begun to differentiate but can still turn into a number of different blood and immune system components, such as red blood cells, platelets, neutrophils, T-cells and B-cells. Bone marrow transplants currently contain a mix of these HSPCs. Hammer's group studies the way immune cells attach to and move along the vascular surface. Experiments from Hammer's lab and other groups had previously shown that T-cells can crawl against the flow, responding to chemical signals of inflammation that guide them to the culprit. Research has hypothesized that by backtracking along blood vessel walls, these T-cells can reach the source of the inflammatory signal without making a full lap of the circulatory system. The researchers hypothesized that HSPCs might behave the same way. Using a mix of HSPCs similar to one that would be employed in a bone marrow transplant, they observed that a majority of cells naturally traveled upstream. They then set off to determine which, if any, types of HSPCs are more likely to exhibit this behavior, and what molecular factors push them one way or the other. "As engineers, we're looking at this complicated phenomenon on a small scale as opposed to a global scale. This way we may find something that immunologists or clinicians might miss," Buffone said. "We engineer out the variables, with the ultimate goal of making mutant cell lines and seeing which ones make bone marrow transplants more successful." The group's experiments consisted of monitoring the direction HSPCs traveled as they attached to different surfaces in the lab. The researchers tested them on a series of artificial surfaces that were each made entirely of single proteins that the HSPCs latch onto on the walls of blood vessels, as well as on human endothelial cells that more fully replicate the natural environment of the circulatory system. The researchers also used antibodies to identify the key receptor on the surface of the HSPCs which seems to control this upstream migration. "Once we block that receptor, greater than 95 percent of the HSPCs cannot swim upstream," Buffone said. While these findings are only early results of ongoing research, Hammer's group believes they are on the right track for determining why HSPCs swim upstream as well as how that behavior can be harnessed to improve bone marrow transplants. "Why waste so much energy to go against the flow? From an evolutionary sense, there must be an important reason," Buffone said. "Our current thinking is that once they've flown by the place where they can most easily get back into the bone marrow, it's advantageous to backtrack rather than to continue circulating." "Because we have demonstrated this phenomenon both in primary HSPCs and in a cell line, we are poised, through molecular engineering, to identify the mechanisms of upstream migration," said Hammer. "Eventually, we'd like to reengineer other cells to do the same thing, which will ultimately be useful for treating a wide range of diseases, including inflammation and cancer."